Ooops I got ahead of myself here, up next is actually a pale ale for early summer; the pilz should show up in July. The early-summer seasonal beer and follow-on to the Kolsch is a Czech Pilsner. 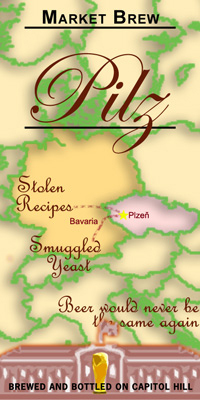 You beer history lesson is that Pilz is the result of repeated failure with standard ale-style brewing in Pilsen, Bohemia. Fed up with their traditional technique, they (purportedly) smuggled yeast from a Bavarian monastery and hired Josef Groll to bring bottom-fermented beer to Pilsen. Combining that style with locally available Saaz noble hops and you get Pilsner, which was first served on 11 November 1842. In gratitude of Groll's contributions to the beer world he was then fired. I should be bottling the Pilz as soon as I have enough empties from the Kolsch to fit it.